Transforming the lives of young adults with disabilities through the power of a job. Eight years ago a young man named Miguel was in his last year of Philadelphia’s Northeast High School when his teacher referred him to the Marriott Foundation’s Bridges from School to Work (Bridges) program. Like thousands of public school seniors across the country receiving special education services, Miguel’s postsecondary options seemed both daunting and uncertain. He needed the targeted interventions that a program like Bridges has mastered over nearly three decades of serving more than 22,000 youth. He needed an adult mentor who would steer him through the complex process of school-to-work transition. He needed help bridging the gap between high school and the world of work. As with all Bridges participants, Miguel availed himself of job readiness and employability skills instruction aimed at preparing him for what to expect in the competitive workforce, a milieu that sometimes tolerates fewer mistakes and grants fewer second chances. But Miguel was committed and earnest in his pursuit of employment, so with the assistance and encouragement from Bridges, he was successful in landing his first job with a Walgreens as a customer service associate. Miguel’s punctuality and dependability at Walgreens demonstrated his potential for the demands of fast-paced production environment with Philadelphia’s Union Packaging, a company that manufactures containers for fast food and casual dining restaurants. At Union Packaging Miguel proved himself able in keeping pace with complex machinery as it churned out food containers to be packaged and shipped to restaurants across the country. He received both pay increases and increases in responsibility. But Miguel’s story doesn’t end there. Not only did he keep in touch with Bridges over the years by sharing his job and career updates he continued to press ahead with efforts to grow and better himself. 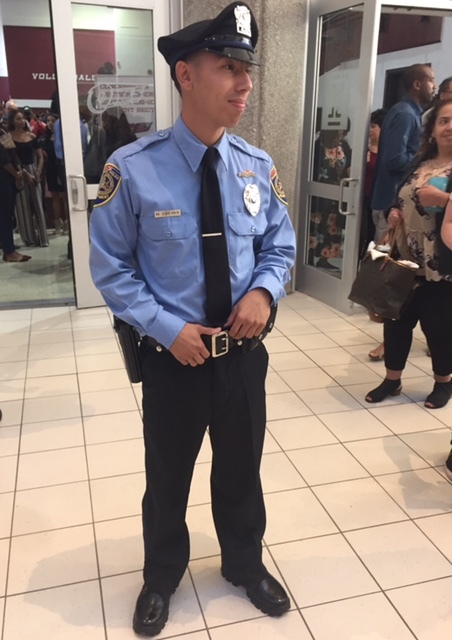 Miguel recently completed training qualifying him to join Philadelphia’s SEPTA’s Police Department. A story like Miguel’s is timely. October is National Disability Employment Awareness Month (NDEAM) when programs like Bridges shine a light on the great work of many in business, philanthropy, and government alike in efforts to break down barriers for persons with disabilities to achieve their employment and career aspirations. It’s the stories of young men and women like Miguel that help the Marriott Foundation’s Bridges program earn a reputation for practicing evidence-based strategies that lead to jobs that build self-esteem, maturity, and independence. Stories like Miguel’s — and there are thousands of them — demonstrate to stakeholders and funders the value of our work. Stories like these attest to the return on investment for grantors who want to see quantifiable and tangible results. Taking the long view, showing commitment and building trust — these are key characteristics essential for young workers to learn in the world of competitive work. They are equally essential to building successful partnerships with program supporters in the competitive world of grant-making and grant-seeking. Similar to our work with youth, the funding and support partnerships begin with assessment and the readiness of parties to enter into a partnership. And these stage-setting steps cannot be shortchanged. Openness on timing, deepening knowledge through site visits, collaboratively scoping plans, to the benefit of all, are essential to the long-term success of the partnership. And taking the employment analogy one step further, the genuine commitment to long-term partnership allows both grantee and the funder to look at the partnership as an investment with an expected return. In real terms, the long-term matching grant from Johnson Scholarship Foundation to Marriott Foundation Bridges allows the organization to position our school-to-work services as social impact seeking added capital to grow, expand and deliver a return for investors and clients alike. This approach is leading to the expansion of Bridges services in Ft. Worth, Boston, and New York City in addition to the nine other cities already serves. Written by Tad Asbury, Executive Director of the Marriott Foundation for People with Disabilities. Originally posted on the Johnson Scholarship Foundation’s blog “Giving Matters” on October 23, 2017. But this year, a recurring theme has emerged that runs counter to “We help kids with disabilities get their first jobs.” In all of our Bridges cities, the young adults we recognize receive a Youth Achievement Award from Richard Marriott, chairman of Host Hotels & Resorts and the Marriott Foundation for People with Disabilities. But in many cases these young people didn’t get only a first job through Bridges; they got a second, and in some cases, a third job through Bridges. This is because Bridges works with these kids for one year, sometimes longer, helping them climb the first few steps of a career ladder. We believe these first few steps set them on a path to independence and lifelong employment. Take for example a young lady named Jamethia in Dallas, whose first Bridges job was as a steward at a Fairmont Hotel, where she worked for one year until the distance became unmanageable. Her second Bridges job, also a steward, this time much closer to home, came at the Dallas W Hotel. But all along Jamethia knew that she wanted stewarding to lead her on a culinary career path. So with that goal in sight, she continued to work, but she juggled her W Hotel job with culinary school, a plan that seems to be paying off. Jamethia, who has been employed continuously for more than two years, is now on her third Bridges job, working for the last nine months in the pastry kitchen at the 1000‐room Dallas Omni Hotel. As she has progressed through each job, Jamethia needed less support and guidance. For her Omni job, she completed the application on her own while asking her Bridges mentor questions over the phone. Clearly, Bridges benefits not only young adults, but also the employers who hire them, as in the case of the Dallas Omni Hotel, which counts this ambitious young lady among its valuable employees. With more than two decades of serving over 21,000 young people, Bridges has perfected a magic formula: Committed, compassionate, quality mentors who match young people with real jobs in businesses that offer advancement opportunities. So, as we celebrate Disability Employment Awareness Month, we at Bridges reflect on the many young adults like Jamethia served each year in the cities of Dallas, Atlanta, Baltimore, Philadelphia, Chicago, Los Angeles, San Francisco, Oakland, and metro‐Washington, DC. Among these Bridges cities, Jamethia is one of many examples of the power of a job in transforming the lives of young people with disabilities. Marriott Foundation for People with Disabilities, Inc.